Chicken Pot Pie - Hello, November. How have you been? 'I've been doing great. I've been plugging away at my classes, working my tail off at work, and in the middle of all that, my 7-month pregnant and closest friend Farrah came for a visit after not seeing each other for 2 years. We ate good food, shopped 'til we dropped, and even got to see some other old friends for a casual get-together/baby-shower which I hosted but of course totally spaced on taking any pictures of the food. 'All that to say, please forgive me when I say that I made this chicken pot pie probably a month ago and am only now getting around to blogging it. Now that I'm looking at the pictures again, it's making me hungry and wanting to make pot pie all over again. 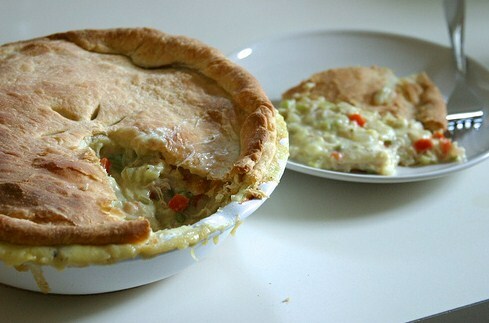 'It's the time of the year for comfort foods, and chicken pot pie has got to be high up there on the list. 'Of course I realize that the ultimate comfort food holiday is just around the corner. 'Did I mention this is my first time hosting Thanksgiving? 'I'm making my first turkey even. 'I'll let you know how it goes. 'There are plenty of other places to get good Thanksgiving recipes, so I'll stay away from giving anyone advice until I've done this a few more times. The one thing I can give you advice on, though, is to go ahead and make this. 'It does everything a pot pie should do. 'It warms you up, reminds you of your childhood, and most importantly, it tastes really good. Let's talk about the crust. I chose not to use the recipe in the book because it calls for shortening, and I'm just not really into it, no matter how flaky it might make a crust. 'Instead, I decided to use a fancy new app on my phone called Ratio, which is from Michael Ruhlman's book, also titled Ratio. 'The idea is that most things can be made according to proportions. 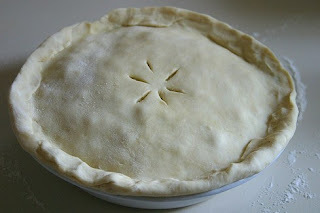 'The proportion for pie dough, according to the app/book, is 3 parts flour, 2 parts fat, 1 part water. 'Also, the recipe only uses a top crust, so when I made the dough, it makes enough for a top and bottom crust, so I just froze the other half. 'If you don't have a scale to measure, you really can do no wrong using Smitten Kitchen's recipe, which, frankly, I use very often. Using a pastry blender, cut the chilled butter into the flour until you see pea-sized pieces. 'Then add only 3/4 of the water. 'Using your hands, work everything together until it just comes together. If it doesn't seem like enough water, go ahead and add the rest, and keep working it together until you can make somewhat of a ball, but can still see visible chunks of butter. Divide in half, then form each half into a rough ball shape, and wrap each half in plastic. 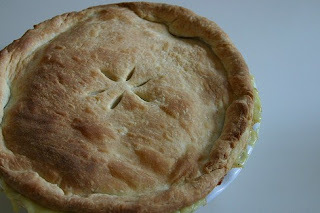 (You'll only need one ball for the pot pie, so you can freeze the other half for when you need it in the future.) 'Chill the dough in the refrigerator for about a half hour before rolling it out. 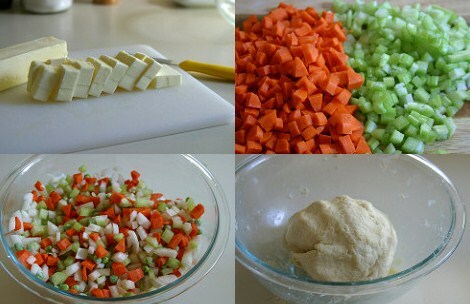 Preheat the oven to 400' F. 'Finely dice the onion, carrot, and celery. 'Over medium heat, melt the butter and saut' the vegetables, including the peas, for about 4-5 minutes, or until they start to turn translucent. Stir in the chicken, then sprinkle in the flour, continuing to stir it all in evenly, and let it cook for a couple more minutes. 'Pour in the broth and the bouillon cube/stock base, continually stirring while everything starts to thicken. Stir in the heavy cream, and turn the heat down to low, letting the mixture cook for another 4 minutes or so. 'Add salt, thyme, and pepper, then taste to make sure it has enough seasoning. 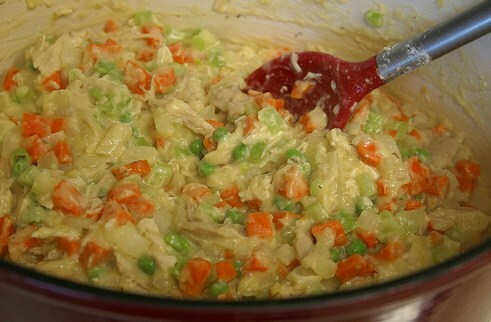 Remove from the heat, and add the mixture to a deep pie pan, or an 8-to-9 inch casserole dish. 'Take the pie dough out of the refrigerator and roll it out large enough to fully cover the dish with about an inch left around the edges. 'Place the dough on top of the mixture and cut a few slits in the top with a sharp knife in order to let out steam while it bakes. 'Push the dough onto the sides of the pie pan or casserole dish to seal, then bake for 30 minutes or until the crust is golden brown. '(I recommend putting a baking sheet on the rack below the pot pie to catch anything that might still leak out the sides.) 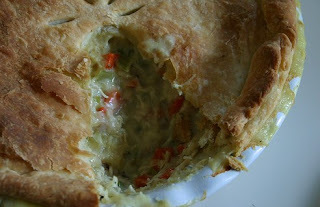 'Let the chicken pot pie cool for about 10 minutes before serving. 'Enjoy!